What if I were President in the future? How would we deal with overpopulation and depletion of resources? We have mapped the United States using Synthetic Aperature Radar (SAR). The 3D topography is very detailed. 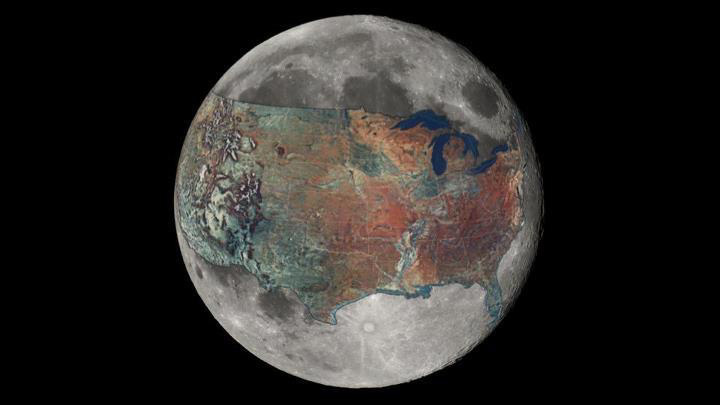 If we put the entire US SAR data set into a super gigantic mobile 3D printer we could recreate America's landscape in smaller scale on the Moon. We would use the power of 3D printing to create "Lunar America'" on the Moon's nearside as inducement to lure colonists to the Moon. "From (lunar) Maria to (lunar) Maria, the New 13 Colonies of Lunar America on the Space Frontier feels just like home!" Russki or Russkaya? Comrades, if you prefer a more isolated region and wide open spaces we recommend New Siberia on the Lunar Farside. There's lots of room for nations that want to participate in the colonization of the Moon. We might even see "Moongolia" someday. Emergency America backup plan: if the United States is wiped off the face of the Earth by cosmic catastrophe use the SAR data and rebuild it. If that were to happen the replicated US would have to be MUCH smaller but the surviving population would also be much smaller.